Google has introduced a “see more” button to their Google Ads. The search engines latest update has brought the introduction of a new “see more” button, that when selected, it takes the searcher to more Google Shopping products. 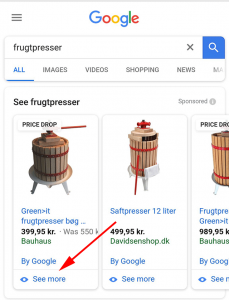 Traditionally, beneath Shopping Ads, Google has displayed a “Quick View” button, however, their recent updates now show “See More” with an eye icon beside it. Do you feel you miss the latest Google Ads updates and feature releases? If so, then contact Mabo today to see how your PPC advertising could benefit from working with our team of PPC management specialists.